As we’ve already announced, Biofaction is taking part in an exciting project, eForFuel and here is our press release to provide you detailed information. You can scroll down to have a look or follow the links to read it in (ENG) or (DE). Austrian science communication company Biofaction is taking part in eForFuel, an exciting EU-funded research and innovation initiative that seeks to provide a sustainable replacement of fossil fuels by using electricity and microorganisms to convert CO2 into renewable fuels. eForFuel is a Horizon 2020 EU project launched in March 2018 and scheduled to run for the next 4 years with funding of around 4 million Euros. The project is led and coordinated by scientists at the Max Planck Institute (MPI) of Molecular Plant Physiology in Germany and boasts the participation of 14 industrial and academic partners from 9 European and associated countries. eForFuel is a truly interdisciplinary project aiming to achieve its research targets of offering sustainable alternatives to fossil fuels. Greenhouse gases (especially CO2) emitted from the burning of fossil fuels are significant drivers of climate change and a global threat to society and the environment. Hence, it is very important to replace fossil fuels with alternative, sustainable sources. Early generation biofuels compete with land resources, limit agricultural production of food, and, therefore, cannot completely replace fossil fuels without severely undermining food security and decreasing biodiversity. In order to overcome this problem, eForFuel provides a novel solution to utilize resources that are essentially unlimited and that are independent of land use: CO2, electricity and water. “What makes eForFuel unique is the sustainable production chain that converts CO2 emissions and renewable electricity into easy to handle formic acid, which is then fed to engineered microbes for the production of renewable hydrocarbon fuels“, says project coordinator Arren Bar-Even from MPI. eForFuel aims to establish and demonstrate a unique integrated electro-bioreactor, which automatically integrates CO2 electro-reduction, formate production and formate bioconversion to hydrocarbons that can serve as “drop-in” fuels. This integrated system will serve as a stepping stone towards transforming the way we produce fuels and carbon-based chemicals. “We will introduce the project to a wider public and initiate a dialogue with stakeholders as well as citizens,” explains Markus Schmidt from Biofaction, leading scientist in the project. Biofaction from Austria will provide an important contribution to eForFuel by taking care of the social dimension of sustainability in the project. In collaboration with its project partners, Biofaction wants to optimize and communicate the societal benefits of these new biofuels. 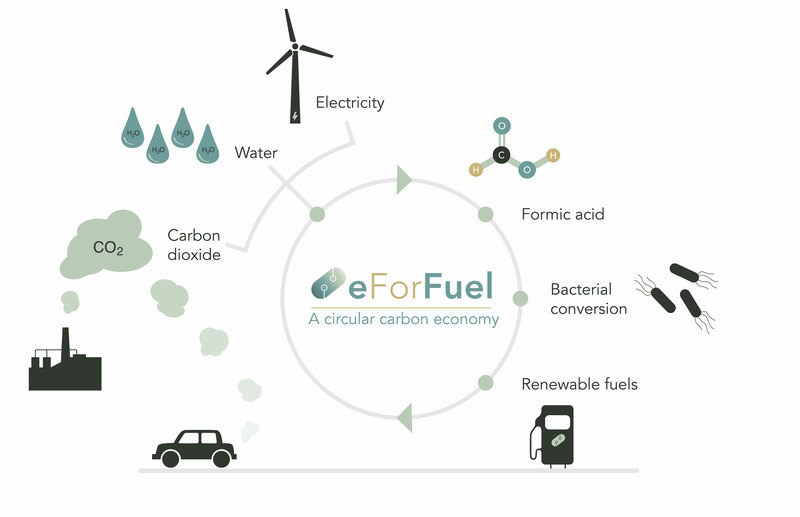 eForFuel, which was launched in March 2018 in Berlin, is a 4-year project funded by the European Union’s Horizon 2020 Research and Innovation programme under grant agreement No.763911.